October 16 – FIFA for $21 billion or Manchester United for $4 billion? When you have $1 trillion, why not buy both? The Saudi Arabian determination to acquire their way to controlling positions in world football’s biggest brands knows no bounds – and football, like business, generally doesn’t discriminate when it comes to money. News on Monday that the Saudi crown prince Mohammad bin Salman was in negotiation to buy Manchester United has been discounted by the club who have reportedly told local media that the Glazer family have not hung up a For Sale sign though publicly refuses to make a statement either way. That won’t matter to the Saudis and their new-found obsession to take control of everything in football that could give them geo-political advantage in a regional battle where they are increasingly being seen by even their allies as the bad guys. The story of them buying one of world’s top three football brands is perhaps one of the few news items that could deflect some focus away from what really happened to Saudi dissident and Wall Street Journal columnist Jamal Khashoggi when he was lured in the Saudi embassy in Turkey and subsequently disappeared. Saudi control of Manchester United would bring them a seat at the top table of English and European club football they were unlikely to have ever have dreamed of until their global reputation hit rock bottom. How likely a sale by the American Glazer family is the real question and business being business, it can’t be discounted. The Glazers have taken over a $1 billion out of the club since their controversial acquisition in 2005 for £800 million. Realising $3 billion-plus would be attractive for any investor. Manchester United co-chairman Avram Glazer has, according to the Sun newspaper, been spending significant amounts of time in Saudi Arabia and is due to attend the Future Investment Initiative conference in Riyadh later this month. Manchester United already have a strategic partnership with Saudi Arabia’s General Sports Authority to help develop football as part of the Crown Prince’s 2030 Vision project to change the country. But it is not just the Saudis’ own country that they want to change. Saudi Arabia’s ambition to hold the presidency of the Asian Football Confederation (AFC) has seen two Saudis declare they will run in the presidential election next year – though the country can only nominate one for election. Adel Ezzat has a short history in football having only emerged in Saudi in 2016 as FA president before quickly standing down and pursuing wider regional ambition. That ambition sits alongside former Saudi playing legend Sami Al Jaber’s whose anti-Qatar ranting would generally be expected to exclude him from passing the election integrity tests. Both are up against AFC president Shaikh Salman bin Ebrahim Al Khalifa who is running for a second full term and who has brought a unity and international confidence never before seen in the AFC. It is very hard to see the government-backed Saudis doing the same. It is a delicate and crucial time in the growth path of the AFC which has fought hard under Salman to bring unity and stability to football in the region – a concept, based on form to date, the Saudis wouldn’t have much time or respect for. While the Saudis are committed to buying their way into the football business (except when it comes to broadcast rights) one hopes that they understand the philosophy of the upcoming football election is not meant to be a transactional arrangement involving cash. The AFC’s electoral committee and ethics functions will need to vigilant. 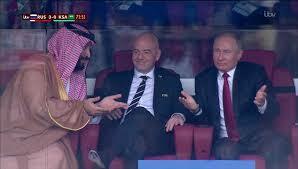 The upcoming FIFA Council meeting in the Rwandan capital of Kigali will see FIFA’s president Gianni Infantino (pictured at the opening game of the World Cup flanked by the Saudi Crown Prince and Russian president Vladimir Putin) once again raise the spectre of the sell-off of its Club World Cup and a proposed new FIFA Nations League competition to replace the Confederations Cup. It is a proposed $25 billion acquisition of rights from an unnamed investor that Infantino tried to railroad through FIFA Council but was rebuffed when he refused to give detail as to the source or nature of the money, or even much detail of the proposed calendar revamp. It is an amount that has no relation to anything achievable in the commercial rights marketplace. But rather than kick the proposal into the long grass for good, it was merely sent away for more information and appraisal – by those who proposed it in the first instance. Infantino said the offer was time sensitive as he lobbied his way around the world searching for sympathetic ears (big clubs liked the idea of more money…). Only it seems it wasn’t as time sensitive as he made out and the promises of pots of cash are apparently still waiting. It is a proposal that would irrevocably change the world football calendar and FIFA’s modus operandi. FIFA’s Council was gently incredulous that Infantino would not tell them the source of the money. It was perhaps more incredible that he would attempt to get this through without telling them – which in turn speaks to his own view of transparency and how he feels he should run his presidency more than anything else. It soon emerged that Softbank were the conduit for the deal and that it was most likely to be Saudi money – presumably the reason for the intrigue and secrecy, though the result has only created more suspicion and distrust (at least amongst those who don’t have their primarily eye on what the digits could mean for them). FIFA’s Council have as big a decision as the AFC members do in their presidential election. To date Saudi Arabia’s only significant contribution to world football has been the undermining of the commercial broadcast eco-system with their tacit approval of the industrial-scale piracy of football leagues and championships (including every game of the Russia 2018 World Cup) on the BeoutQ channel that broadcasts via Riyadh-based Arabsat to the country. The obvious loser in this debacle is Qatar-based beINSport which has been the biggest sports rights holder in the middle east and northern Africa for a number of years and a key financial partner for a number of sports and leagues. The long term impact for football is obvious and infectious for other sports rights holders who are already discussing whether they need to pay such high rights fees for their content. The obvious impact is that sport will lose money – it is happening now. So how serious should the Saudis be taken in their Manchester United and FIFA acquisitions? The simple answer is very, if they are truly prepared to put their money where their mouths are. And with the Saudis this is a big question as they have a long history of not fulfilling on monetary promises, not least in football. The only sensible deal for a seller would be an upfront payment, in full. There will be some – FIFA’s president in the vanguard – who will argue with anyone who will listen that Saudi money is a good thing. The problem is that it probably wouldn’t be used for good things. Just ask Jamal Khashoggi, if you can find him.